Holy smokes, guys. 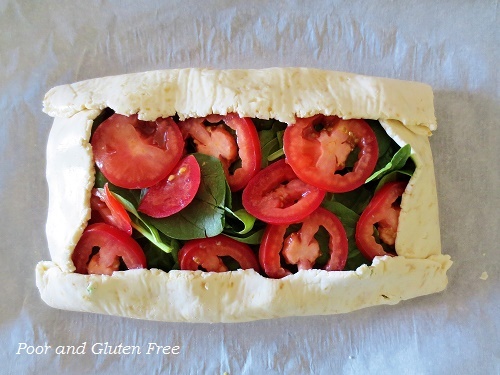 This gluten free galette is insanely good. So good that my husband and I both ate waaaay more than we should have and and felt like bloated fish afterwards. So here's my warning: When you try this, eat slowly - don't gobble - and wait for things to settle before you go for seconds! 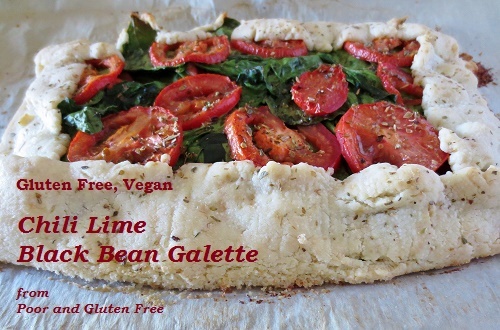 Wondering what a galette is? It's usually one of two things. A galette is the French term for either a free-form sort of pastry cake OR it's a buckwheat crepe / pancake filled with savoury stuff, like eggs, meat, or cheese. So this galette is the free-form pastry that I've stuffed full of Mexican-inspired fillings and I swear this French-Mexican fusion couldn't have turned out better. These chili lime black beans are TO DIE FOR. My husband is not a fan of beans in general, but he ate half the galette in one sitting, and has been asking for more ever since. 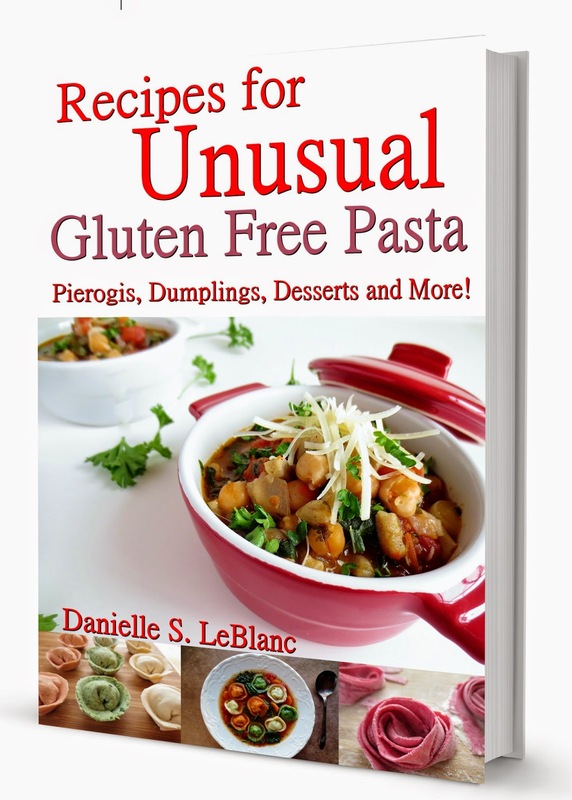 And of course, due to my lazy cooking style, this is also very easy, very healthy, and very flexible. First I make the galette crust, a slightly modified version of my Gluten Free Pie Crust, and let it chill. In the meantime I make the chili lime black beans and prep my filling. Bake and enjoy. Slowly. Try not to gobble. Don't worry, this is really easy, I promise. The amount of ingredients and steps below looks time-consuming and complicated, but it's really not at all. The dough takes a couple of minutes to make, and in the 10 minutes it needs to chill you'll have more than enough time to prep your filling and everything else you need. So don't panic! Also, galettes are super flexible. You can essentially put anything you want in them, fruit, eggs, sausage, leftovers from the fridge, whatever, so if you don't have everything listed here, experiment! To make galette crust: In a food processor (or using a pastry cutter or two knives) sift together flours, sugar, and salt and mix. Pulse (or cut in) butter until the mix is crumbly. Add water and apple cider vinegar together and pulse or blend into flour mix until a ball is formed. If, after pulsing or mixing for a minute or so, the dough is still crumbly, add cold water by the teaspoon and mix until a smooth ball forms. 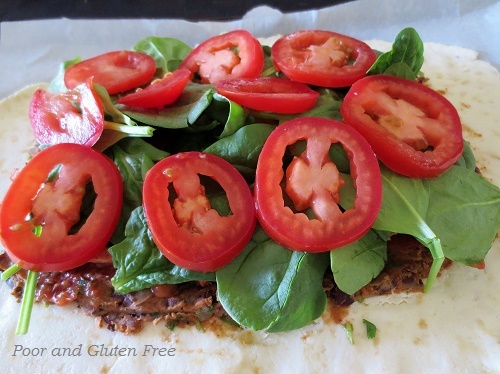 Pat into a flat oval (this makes it easier to roll out after), wrap in parchment or waxed paper and chill 10 minutes. In the meantime, make the chili lime black beans: In a large frying pan, heat olive oil over medium heat. Add onion and garlic and cook for 5-7 minutes, until onion is translucent. Add beans, lime, chili and cumin powder, and salt. Mash beans with a potato masher or back of spoon and continue mixing until beans are mostly mashed (about 2-3 minutes). Remove from heat and mix in cilantro. 2. 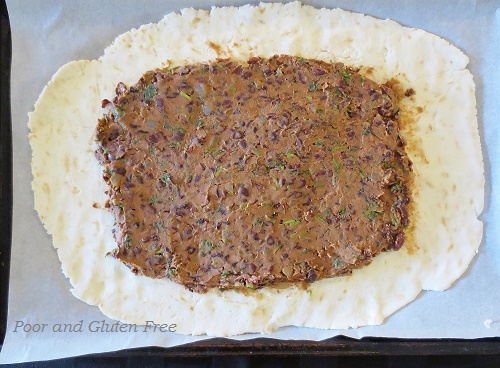 Spread chili lime black beans filling over galette, leaving 1.5 - 2" free around edges. Spread prepared salsa over beans. 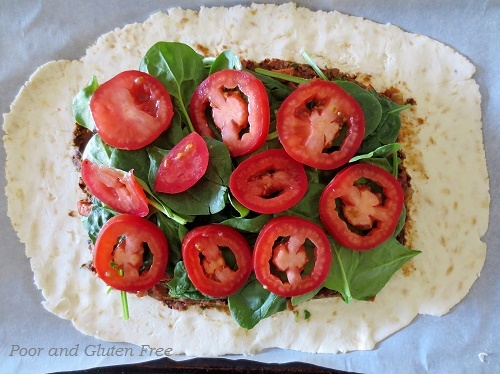 Pile spinach over salsa, and top with sliced tomatoes. Fold edges of galette up over filling. Optional: Wash with a bit of melted butter (or vegan alternatives listed above). Then sprinkle with dried oregano and salt and shredded cheese, if desired. 3. 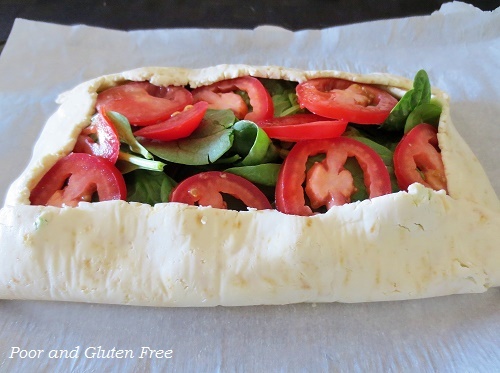 Bake for 20-25 minutes, until crust is lightly browned (crust will not get very dark). Now try not to gobble. Have you ever had a galette before? What types of fillings would you like to try? 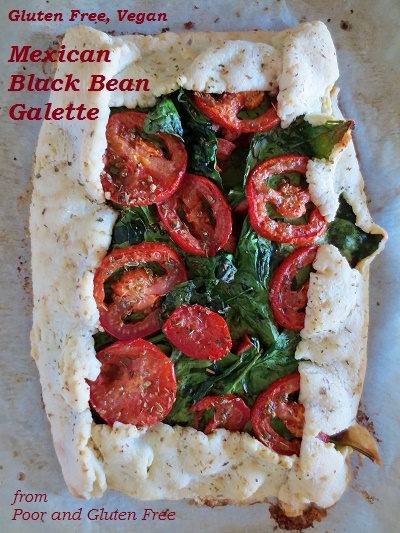 Your Galette looks exceptional! Love the photos too. I am really, completely craving... THAT CRUST!! No kidding, eh? I love Mexican food! Thanks! 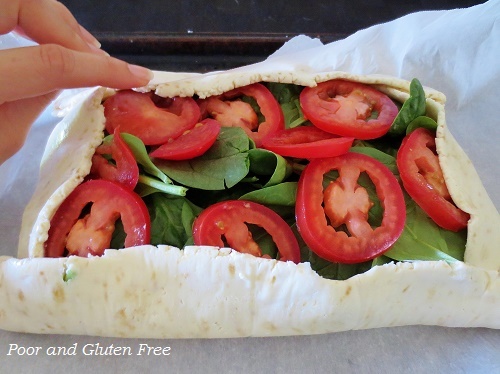 It's pretty versatile, you can toss whatever into it ;) And thanks for hosting Meatless Monday! This sounds great! 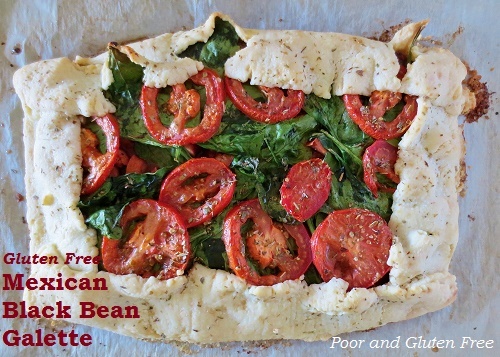 I have a similar recipe (but with gluten in the crust) that my mom calls Mexican Pizza but my family renamed after finding out how good it is with other flavors of fillings, too: Flexican Cornbread Pizza! Haha! I love that, that's so cute!